Want to use PenDrive as extended RAM for your Windows XP and Windows 7 Computer than follow the very easy steps given in this post to use your Memory Card and Pen drive as RAM to make your Computer yo work more faster. In this post I will explain you detailed steps on using pen drive as extended RAM in Windows XP and Windows 7. Now see the very easy steps given below to use pen drive as Ram for your computer. First connect your pen drive to computer. Note that pen drive should be at least of 1GB. Now right click on the my computer and then click properties. Click on Advanced Tab and then Performance. Now click on Advanced and then click on Virtual Memory. Select your pen drive icon and click Custom size. Now view the memory available in your pen drive and note it down then click on OK. Restart your computer and enjoy your fast system. That's It... You will be able to use your USB Pen Drive as RAM in your Windows XP Computer. 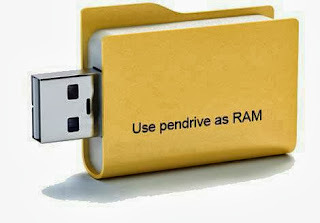 Now follow the steps given below to use pendrive as RAM in Windows 7 PC. Insert an empty pen drive. Click 'quick boost or ready boost' set allocation value to maximum. That's it!! Now the pen drive will act as an external RAM, thus making the PC to work more faster than previous one. . .